Is it fair that women must pay sales tax on tampons while men's health products like Rogaine are tax-free in many states? Women around the country say it's not -- and they're pointing to Canada, which just eliminated its tax, as an example to be followed. The issue is being pursued both in the courts and legislatively. In New York, a lawsuit filed by five women says the state's tampon tax is irrational and discriminatory, Courthouse News Service reported. "Medical products exclusively for women are taxed," the complaint states. "Medical products also used by men are not." Led by actress Margo Seibert, the complaint argues that the tax is burdensome for low-income women and could lead to health problems for those who use substitute products. It estimates that most women spend $70 per year on tampons and pads. Most states exempt items defined as basic necessities from sales taxes, and that's how the growing anti-tampon tax movement says women's hygiene products should be treated. In California, Assemblywoman Cristina Garcia is sponsoring AB 1561, a measure to make feminine hygiene products exempt from sales tax. Currently, women in California pay over $20 million annually in taxes on tampons and sanitary napkins, paying on average seven dollars a month for forty years, Garcia said in a news release. Garcia argues that feminine hygiene products are a basic necessity and should be free instead of taxed. Lawmakers in Tennessee are considering a bill that would reduce the tax on tampons to the same five percent now charged on groceries. An earlier, unsuccessful measure would have required men to go through legal hurdles to buy erectile dysfunction remedies. It's an uphill battle, though. 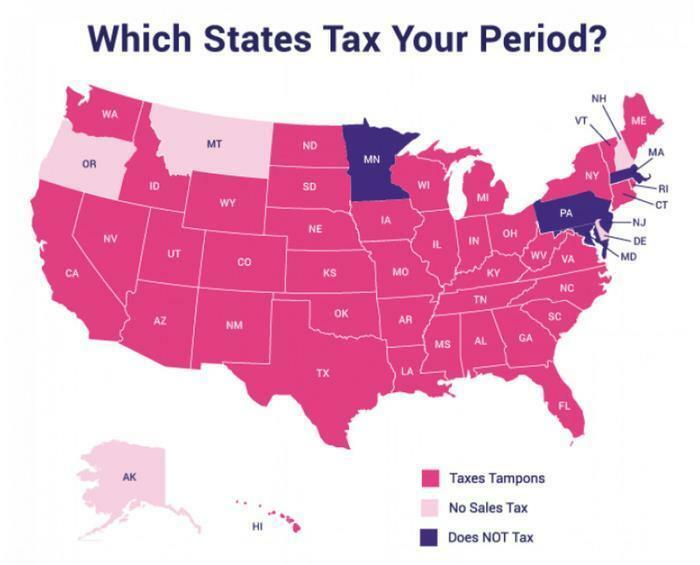 According to Fusion, only five states have decided not to tax tampons: Maryland, Massachusetts, Pennsylvania, Minnsota and New Jersey. (There are, of course, a few states like Delaware that have no sales tax on anything).